GPS Tracking Lite v2.0 has arrived! 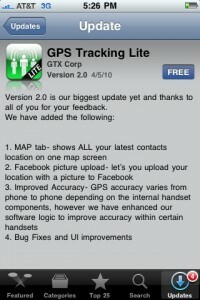 GPS Tracking v2.0 is our biggest update to date, and includes the following new and improved features. 1. The Map Tab – now shows ALL your latest contact’s locations on one map screen. Very convenient! 2. FaceBook connect – allows you to upload your location to FaceBook including a map. 3. Improved Accuracy – GPS accuracy varies from phone to phone depending on the internal handset components, however we have enhanced our software logic to improve accuracy within certain handsets. 4. Bug fixes and UI improvements. Download GPS Tracking Lite for free. Android owners search “GPS Tracking” in the Android Market.